Living in New York City, I don’t get a whole lot of quiet time. I fall asleep to sirens and wake up to garbage trucks. Needless to say, meditating — or relaxing at all, for that matter — in the city that never sleeps isn’t easy. So when my boyfriend brought up trying a sensory deprivation tank, I was intrigued. After Googling what exactly it was — because, to be honest, I had no idea — I was more than willing to take the plunge. 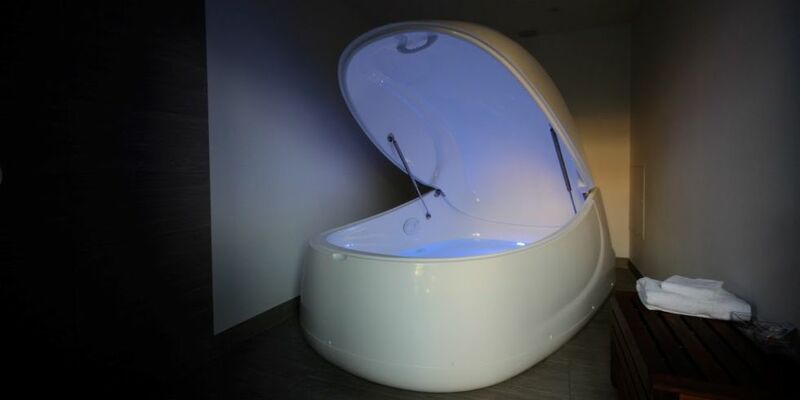 It sounded easy enough: float in an isolation tank full of water and 1,000 pounds of Epsom salt for an hour. No light, no sound, no distractions — nothing but your (naked!) body. At Lift / Next Level Floats in Brooklyn, a single float costs you $99. As soon as I walked through the door, I was greeted and taken back into one of their tank rooms, equipped with a shower and a lit-up pod that looked like it was dropped straight out of a sci-fi movie. I was told to shower, then the timer would start as soon as I got in. After enclosing myself into what felt like a completely different universe, I had only one thought: How am I going to float in complete silence and darkness for an entire hour? As someone who needs to be doing something at all times, I found the first however-many-minutes to be agonizing. Like a true first-timer, it took me a while to get over the fact that I was actually going to relax with nothing to distract me. After lying there in pure darkness for a while, wondering what I’d gotten myself into and how long it would be before someone came in and murdered me, I decided to turn on the star-like lights at the top of the tank. But it wasn’t working for me. If I was going to do this, I had to do it 100 percent. So I convinced myself that my pod was safe and I could relax. And once I got over the weirdness of being in such an isolated environment, the one thing I really wanted finally happened: My mind shut off. It was pure bliss. I had no idea how much time had passed, and with my ears slightly below the water, the only thing I could hear was my own heartbeat. Thanks to the buoyancy of the salt, I felt like I was floating through space with absolutely no gravity to hold me down. I started to not be able to tell the difference between the water and my skin; everything was one. At one point I remember it felt like I was floating in glue. I wasn’t thinking about work, money, or what I was going to make for dinner once I got home. The one thing I do remember thinking about was life — what I wanted, how I felt about it, and the meaning of it in general. And that’s the whole point of sensory deprivation therapy, aka restricted environmental simulation therapy (REST): allow the body and mind to experience an environment that has zero stimulation. Studies have looked at REST as a potential treatment for everything from high blood pressure to addiction, anxiety disorders to sports injuries, but I found it to be a pretty effective treatment for, well, modern life. Then music started playing in the tank. At first, I was incredibly out of it. Then I slowly came back to reality and sat up, knowing my 60-minute session was over. I fiddled around for the light switch, blinded myself once I turned them on, and stepped out of the tank feeling a mix of rejuvenation and confusion. After showering and getting the salt water out of my hair, I said my goodbyes. And I’ve gotta say — as calming as the tank was, the next 24 hours were even better. I felt relaxed at a level I haven’t felt since I was probably a kid. You know, long before I knew what responsibilities were. And that feeling lasted all night and through the next day. I woke up before my alarm (gasp!) in the most peaceful way imaginable. My eyes slowly opened, and for the first time in months, I wasn’t completely mentally drained. Unfortunately, everything was pretty much back to normal a couple days later (besides the faint smell of salt water left behind in my hair), but now I know exactly why there are thousands of people who use REST on the regular. It’s hard to shut off in this day and age, but when you do, there’s nothing better.